How is it that some people easily overcome challenges while you might struggle? Their brain does something differently from your brain. Take a quick minute to go through this list to see what you might identify with. You are in the same job as a couple of years ago even though you felt you wanted something different. You go from one relationship to another, and you keep getting the same type of person. Or, you keep making the same mistakes with your spouse. You've been wanting to move, but you are still in the same place. You do courses but don't apply what you learn. Credit card debt isn't getting smaller, or your retirement account is meager. You're not cutting back on chips, sweets, or fast food. You've gone years without a real vacation. You get books but don't read them. Your garage is messy, your basement needs cleaning, or your kitchen shelf paper is falling apart. Another season passed without doing what you want. What did you check off? That gives you an idea of what happens when you don't deal well with challenges. So… Are you ready to train your nonconscious mind to be a challenge-buster? Paul Scheele created 6 amazing Paraliminal recordings so you can wire in the ideal way to deal with any challenge. 1) Use the first four Paraliminals once or twice to wire in a 4-step mental process. Paul calls this the Natural Brilliance process. You'll learn why a little bit later. 2) Use the other two when problems come up in the future that do not automatically resolve or when you feel you need a boost. There's a lot of free information on the internet to help you deal with challenges, but nothing wires in change on a deep nonconscious level like this. Nothing sets you up for success like a Paraliminal. This is actually what people who easily overcome challenges do. Paul figured it out using his expertise in Neuro-Linguistic Programming. He uncovered their nonconscious mental strategies and designed them into the Paraliminals of Natural Brilliance. While counter-intuitive, the first thing you must do when you are faced with a challenge is to let go. You need to release mental and emotional attachment so you are not caught up by them. Something breaks and you don't have the time, money, or knowledge to fix it. Could be the car, a window, your computer, a fallen tree in your yard, or _________________. There's a problem at work. You are responsible for fixing it, but you have no idea how. Or maybe you have ideas, but you don't think they will work. Something with your health keeps getting worse, the airlines lost your luggage, the restaurant doesn't have your reservation, a traffic tie-up will make you late, a neighbor was burglarized and the culprit is on the loose, a friend has cancer, and it's raining on your way to the lake. No matter the problem. Release it. Yes, it is easier said than done, but the "Release" Paraliminal will make it an automatic process. People who can naturally overcome challenges at will, automatically release when faced with a challenge. It neutralizes issues so you can move beyond them. "Natural Brilliance has really helped me. The first morning after using it, I was impressed with how clear I felt, and how much better my energy was. It's like it's taken a monkey off my back! I feel like I think more clearly and I have more confidence in my own thoughts and judgement." Simply notice the circumstances around the challenge. Because you've done the "Release" Paraliminal, it will be easy to keep judgement, doubt, anxiety, and other emotions out of the picture. You'll begin to notice new choices that perhaps you didn't know you had. These choices make dealing with the challenge seem effortless. You'll see invisible barriers that have kept you stuck before, and you'll see how you can move beyond them. Your intuition has space to rise up and help you. It is not held down by fear or emotions. "I bought the course to stop procrastinating. After the course, I have discovered that I am more relaxed and stress free and that the to-do list that was stressing me out is full of non-important items which do not even align with my core values. I was focused on the wrong things! The clarity is wonderful." Take action. Do something about the challenge. It will be infinitely easier because the first two Paraliminals taught your nonconscious to Release and Notice. Hesitancy and fear have diminished. Confidence has increased. You can take action. "The more I listen to the audios, the more changes I experience in my day to day life, like more self-confidence, less procrastination, less fear about living freely. I just feel more connected to life and feel moved to do things that I was afraid to do before." – Aubrey Winnipeg from Manitoba, Canada"
This is a head-scratcher for most people. For those who can overcome any challenge at will, it is second nature. You need to Witness what happened as a result of your Action. How did it work? Did it solve the problem? Did it help? If not, simply begin the process all over with Release. Not every action you take will result in success. But you'll never know until you try it. And when you Release, your mind will be much clearer to Notice great options and the Action to take. "I used the course to increase my ability to write a 5-minute stand-up comedy routine, and give me the confidence to fearlessly take the stage. After my routine, audience members came up to me and asked me if I had been doing stand up for years." So often friends have wondered how I can stay calm in a crisis. It's because I now automatically run through the Release/Notice/Respond/Witness cycle. I may have to run through it multiple times, but I always come out of the other side. For example, in June I had a major two-week trip involving eight flights. A wrench was thrown into the mix on the first day, and I spent three hours at the airport trying to resolve the problem. One telephone call was over 90 minutes long while standing at the airport. I kept trying everything, and even though most of my solutions failed, I resolved the problem and the trip was completely salvaged. I simply ran the Release/Notice/Respond/Witness cycle over and over. Was I aware I was doing it? Nope. I simply did it. I remained calm and worked to figure the problem. Was I always like this? Nope, as friends and co-workers can attest. But, Paul Scheele had uncovered the process using NLP, then we created the Natural Brilliance Paraliminals, then I used the Paraliminals, and now it is wired in. And today you get to use the new 20th Anniversary program right now. "Natural Brilliance moved me two steps forward. It got me past a stuck state of not knowing how or where to find a better living situation in my city, to realizing that what I really wanted was to move to a different part of the country. I realized this about halfway through the program. It allowed me to access the wisdom of my subconscious, and now I'm planning the move. I am very impressed with how quickly it got me unstuck." Twenty years after we first introduced Natural Brilliance, we proudly and eagerly present the completely revised and rerecorded course. Dr. Paul Scheele spent the last several years incorporating what he's learned into this magnificent personal learning course. Even the Paraliminals have been reauthored and rerecorded for you to get even more benefit from the program. 1) Listen to the first session. This will give you a foundational understanding of how your brain works on challenges, how the four steps of Natural Brilliance overcome challenges, and how to get the most from the Paraliminals. Most importantly, you'll choose a challenge in your life to overcome. Pick a juicy one! 2) You will then have a recorded coaching session and Paraliminal for each of the four steps. Listen to them in order, and do the Paraliminals for the challenge you've chosen. 3) Listen to the two Natural Brilliance Generator Paraliminals. Paul suggests listening to one before bed and the other when you wake up. Plan on revisiting this session periodically for a boost, maybe once every six months. How will you know when to listen again? When your life isn't flowing. When you find yourself having to talk yourself into projects. When things begin to get in your way. While the effects of listening to the Natural Brilliance course can be permanent, the world is always throwing stuff at us. Re-listening is your way of dealing with whatever comes your way. 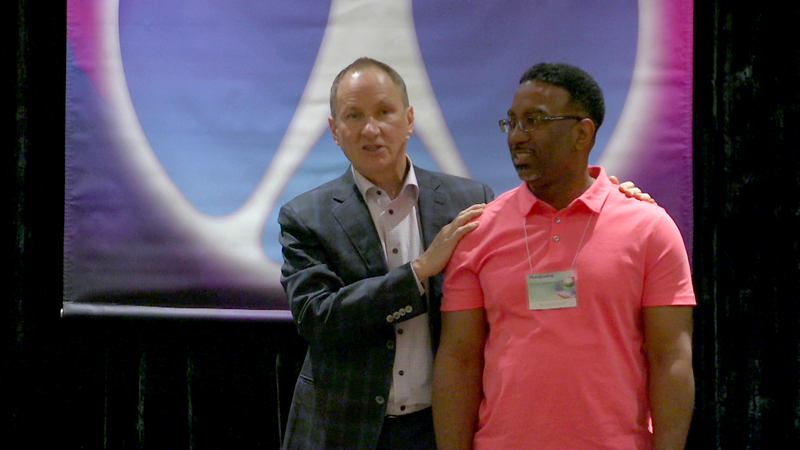 4) Paul led a two-day seminar on Natural Brilliance, we filmed it, and you are now able to watch the videos. You'll get the entire 4-step process from a slightly different perspective, which makes it easier to wire in the process. More importantly, you'll hear from seminar participants, which will give you more ideas on what can happen for you. That's it! Everything you need to wire your brain to overcome challenges. Stuff will always come up, but now you have the way to deal with it, move beyond it, and enjoy the success you deserve. "Shortly after I received the Natural Brilliance program I was asked to take over a troubled Project for a large banking group located in New York City. "There was so much strife between the teams from several different parts of the company that the corporate auditors attended weekly team meetings, along with several third and fourth level managers. Weekly meetings lasted hours. "Within a few weeks, I was able to turn the project around, so that everyone worked together cooperatively and eventually brought it in successfully. "At the end of the project one of the auditors called to find out why this project was so much more successful than the other similar projects. "I told her it was my belief that there was a solution for every problem and that we ran the project with that attitude. "I believe the Natural Brilliance course gave me the problem-solving tools and confidence to transform the team from the competitive, infighting bunch of people from different departments into a cooperating, solution-oriented team." Why is this amazing process called Natural Brilliance? Because it gets the problems of life out of the way, and allows your natural brilliance to shine through. Imagine if you could easily move past challenges? What could you create with your life? What energy do you currently bind up in problems that could be released for creation? What could you do with a clean slate? How can your life be different, better, extraordinary? It starts with you using the reimagined Natural Brilliance personal learning course to overcome challenges at will and create a life of natural brilliance. P.S. Finally, be free of the "model of failure" that holds you back from achieving what you want, even if it is as simple as getting around to doing an annoying five-minute job that you've been putting off for months. Order the Natural Brilliance personal learning course today!